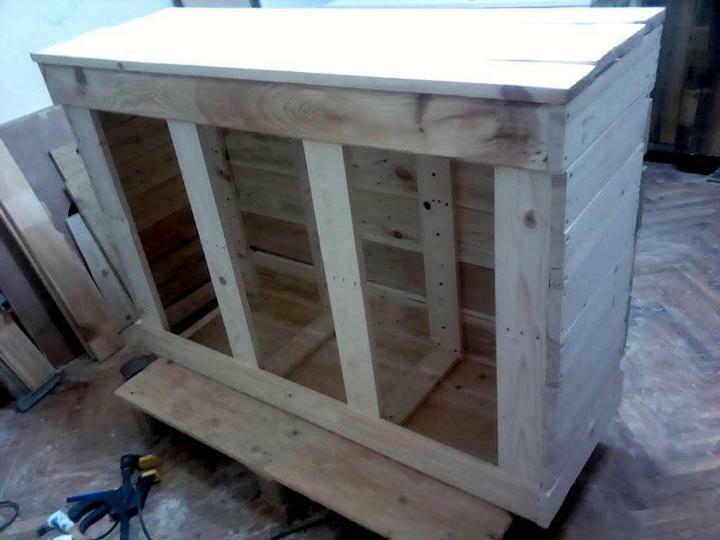 The things or the pallet projects we bring to you here on the DIY projects are mainly focused on the functionality perspectives so that you can make the most out of them enjoying your homey practical applications being fully satisfied. 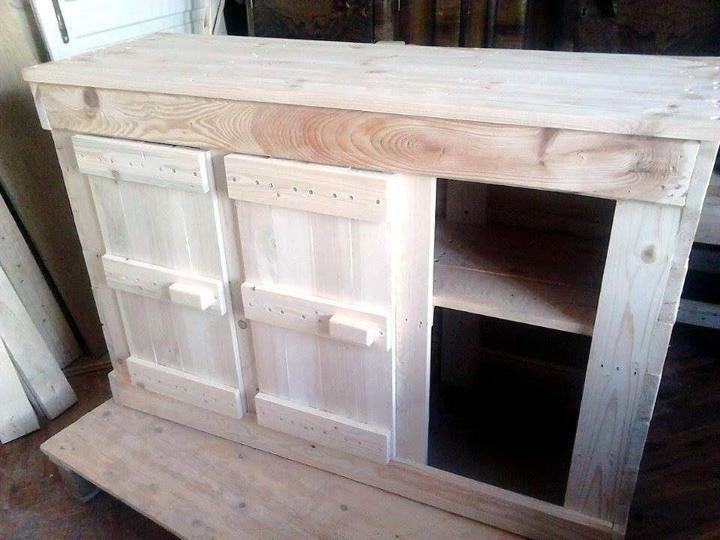 As storage is the biggest demand and toughest challenge for a home gorgeous home dwelling that is why we have with us this storage console DIY pallet cabinet unit for Kitchen which can perform many useful roles in your interiors making it look and act much better. The first avatar it can be given is the entrance storage cabinet or it can be displayed in the hall for the same purpose. It can also act as a media console table letting you organize all your media stuff at one place or it can be subjected to the kitchen island use. 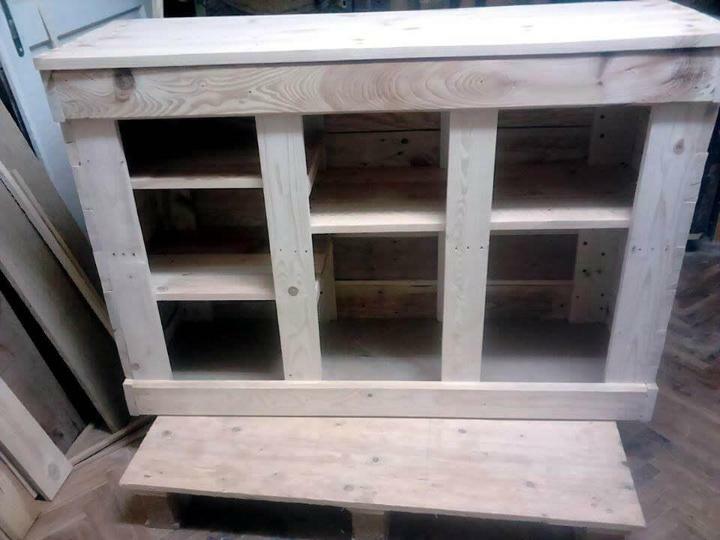 Pallet boards, planks, and slat pieces have been stacked together very intricately and smartly to give you this sleekly designed cabinet unit with sufficient storage cabinets inside for the holding and housing of various things at home. a matching finish complementing home décor would make it look enchanting too along with being super useful. 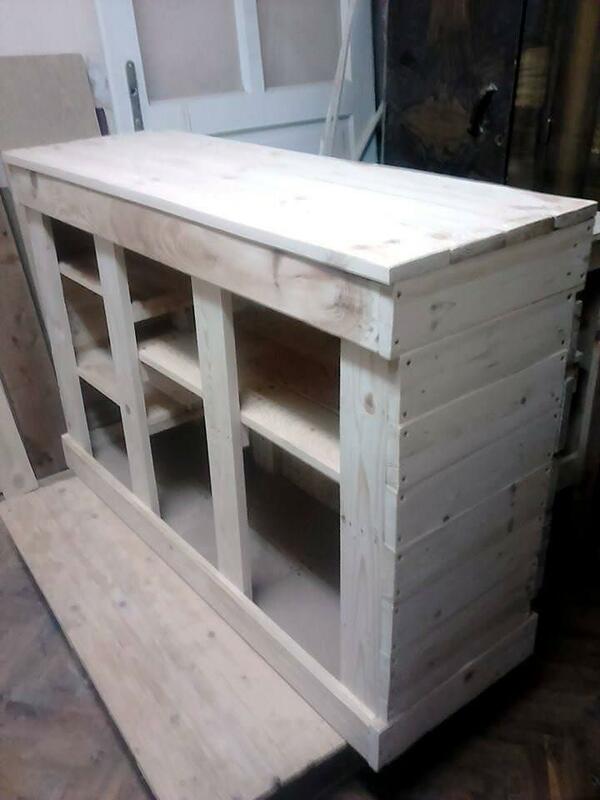 This pallet cabinet unit has been installed using the pallets and all the basic and needy tools and types of equipment like saw, drill, hardware, screw gun etc. 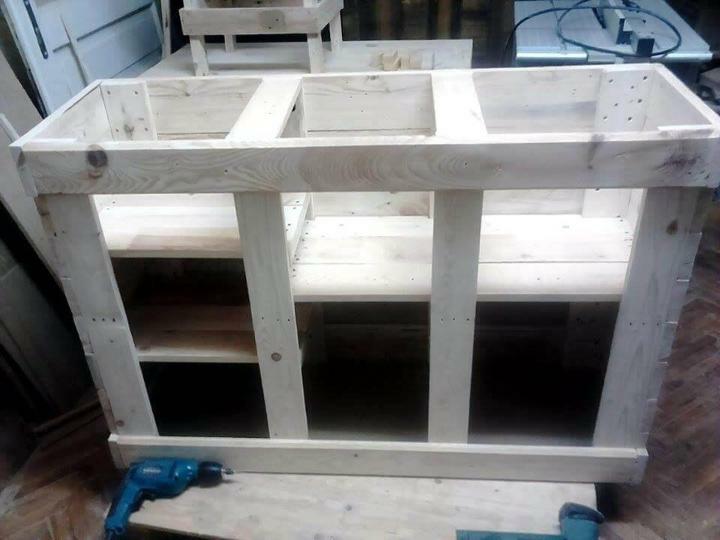 First of all, pallets have been cut into slat pieces which have been packed together to form the back, sides, base, inside shelves and the front structure. 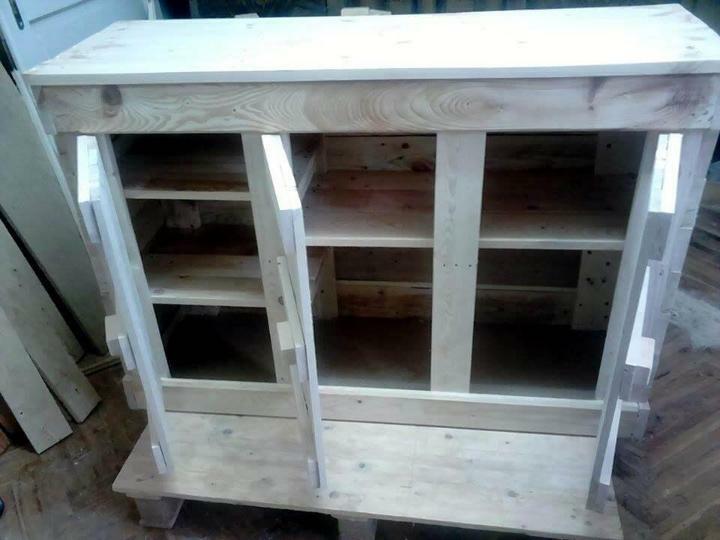 In the second step of this cabinet unit construction the cabinet has been provided with the top shelf which has been easily done by stacking the long and thick pallet slat pieces together with the help of nails and hammer strokes. The cabinet units have been divided into three sections of the sub cabinets with the help of the dividers which are also the thick and bit wide pallet slat pieces having been tightly nailed at equal intervals to the cabinet. The top edge and the base of the cabinet have been provided with the boundary like slat piece which really supports the structure of the cabinet unit and adds a positive contribution to the cabinet unit design. 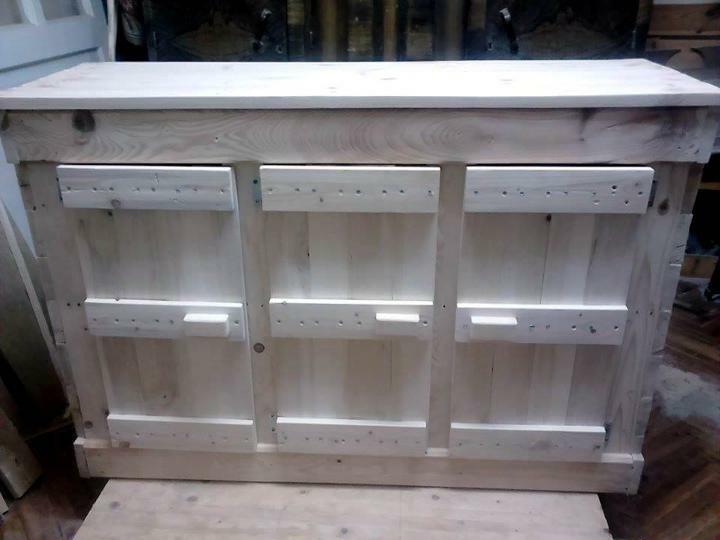 In this step, the doors have been provided to the cabinets one by one which has been prepared from the pallet slat packaging earlier with wooden knobs and hinges have been used to make them join with the cabinet unit. The use of the metal hinges for the insertion of the doors to the pallet cabinet unit would make the door suspend when opened to use for the holding of lots of items in depending on your storage needs and desires. 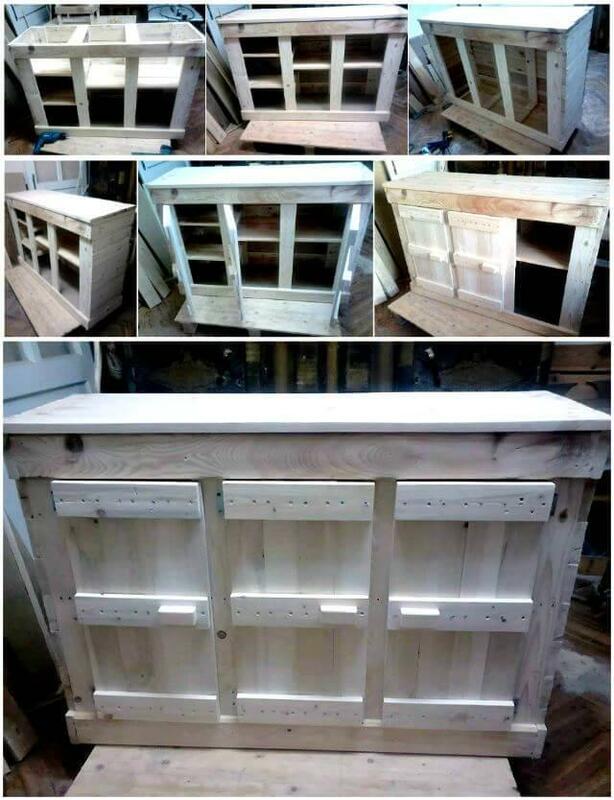 Here is the complete look of the cabinet unit showing off a rustic finish with only sanding as it is to make a traditional display in your spaces but the look can be changed per your home decor preference using matching hues and shades.